Tipard PDF to Word Converter Free Download Latest Version for Windows. It is full offline installer standalone setup of Tipard PDF to Word Converter for PC. Tipard PDF to Word Converter is an application which will convert your PDF files to Word or RTF files with utmost accuracy and at very high speed. Tipard PDF to Word Converter will let you select the specific page in a whole document which you want to convert into Word or RTF file with its Page Range feature. And yes off course you can also convert whole documents. This converter will retain the original text, images and the layout of the PDF file into your Word document. You can also Download Quick PDF to Word for such features. This very simple and easy to use converter supports all Windows version. The conversion process is also very simple. All you need to do is to launch the application once the application is launched then you need to click on the Add File icon and then select the required PDF file which you need to convert. You can also convert whole folders of PDF files for that you need to click on the Add Folder icon. Once the source file is selected then you need to specify the output folder for the converted files. After this you have to define the page range for conversion. Then you need to press the convert icon and the rest is done by Tipard PDF to Word Converter. The application also updates automatically which means you will always have the latest version. AVS Document Converter is another great tool to convert Documents in multiple formats. 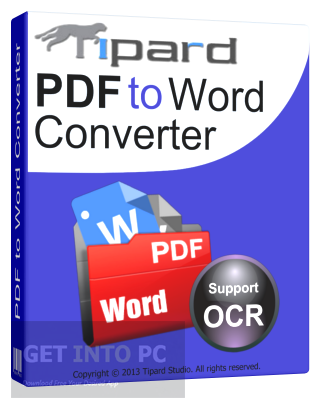 All in all Tipard PDF to Word Converter is a very handy PDF to Word converter which will convert your PDF files into Word and RTF files and that too with original text, images and layout. Below are some noticeable features which you’ll experience after Tipard PDF to Word Converter free download. Can convert the PDF file into Word and RTF files. Conversion is done with utmost accuracy and at high speed. Page Range feature included for defining the range of pages you need to convert. Can retain the original images, text and layout. Can convert whole folders at a time. Before you start Tipard PDF to Word Converter free download, make sure your PC meets minimum system requirements. Processor: 1.2GHz Intel or AMD processor required..
Click on below button to start Tipard PDF to Word Converter Free Download. This is complete offline installer and standalone setup for Tipard PDF to Word Converter. This would be compatible with both 32 bit and 64 bit windows.